We Hope For Your Positive And Prompt Reply. We Assure You About Our Good Services With Product Quality And Intricate Details At So Matchless Price And Every Possible Images. BRIGHT SIDE OF PHOTO IS SELECTED AND THEY ARE BRIGHT DUE TO HEAVY FLASH AND LIGHT. Design : Portable Mini Designer Dresser Dressing Table. Material : MDF, Fox Leather. As they say - "Communication is the key to any relation", communicate your problem, grievance for faster resolution of any disputes. Design : Portable Dressing Table. Material : MDF, Fox Leather. As they say - "Communication is the key to any relation", communicate your problem, grievance for faster resolution of any disputes. GORGEOUS LIGHT GREY NATURAL FINISHANTIQUE PEARL MIRROR 3 DRAWER FRONTS DRESSER/NIGHTSTAND. HAND CARVED APPLIQUE OVER MIRROR. 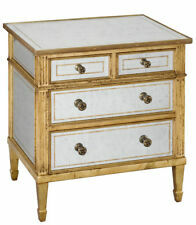 Fabulous good quality bedside nightstand table. Solid walnut oak wood with eglomise silver leaf tempered glass. Brass knob handles. 2 small drawers and two long drawers. NICE UNIQUE ELM NATURAL WOOD WITH CHAMPAGNE BRUSHED STEEL MIRROR.